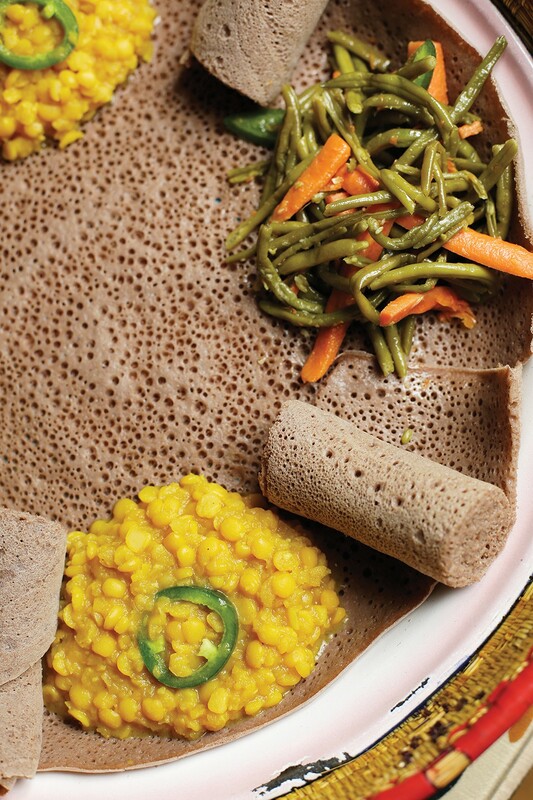 Chef Almaz Ainu's restaurant is faithful to Ethiopian traditions. Food is love in Almaz Ainu's world, and it's all meant to be shared. 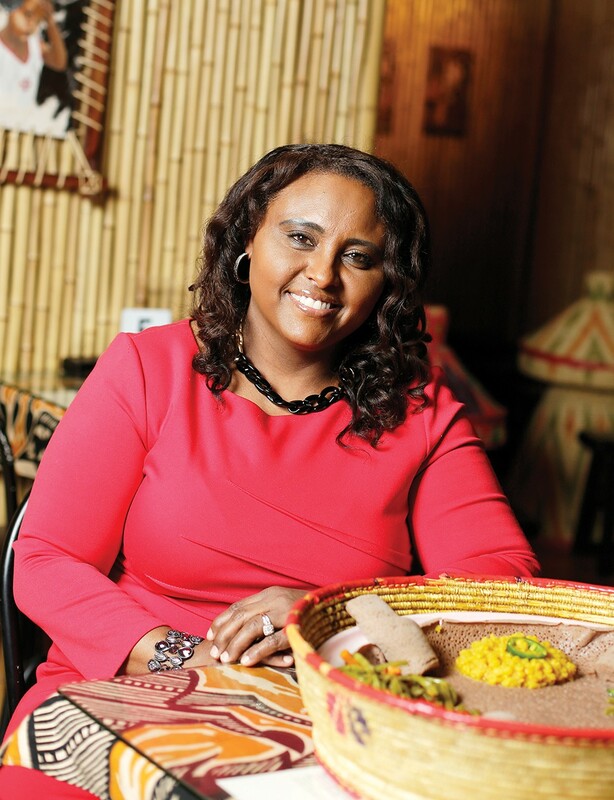 "The most rewarding thing about this business is the social aspect in interacting with the customers that come in," says Ainu, who started Spokane's Queen of Sheba Ethiopian restaurant in 2010. "I'm a people-person and love talking with people and teaching them about my culture and food." 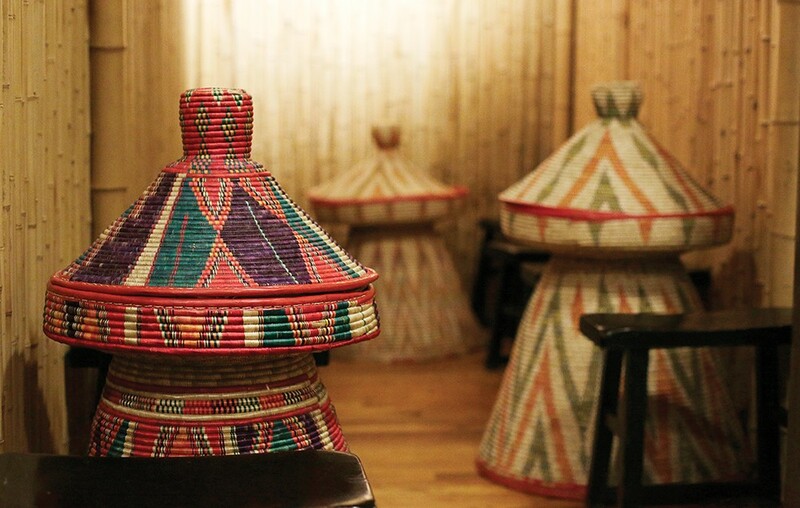 Located inside the Flour Mill, Queen of Sheba features the traditional Ethiopian foods Ainu grew up with. "It's part of our culture for all girls to learn to cook, so my mom taught me," says Ainu, who met her husband when both served as Christian missionaries in Kenya. Ainu taught pre-school in Washington and California for 17 years. After a 2007 trip to Africa with her husband and two children, Ainu returned with her own mission: to open a restaurant. As one might expect outside Western cuisine, meat features less prominently in Ethiopian cuisine than vegetables, which are showcased amongst spices like cardamom, ginger and turmeric. Berbere is an Ethiopian and Eritrean spice blend — a word from which we get barbary, as in Barbary Coast — that varies depending on the maker and application, sort of like Indian curries. One berbere essential is red chilies, which lend a beautiful scarlet-orange color and heat to Ainu's spicy stews: yesiga we't (beef), yebeg kay we't (lamb), doro we't (chicken) and the vegetarian yemeshir kik we't. "We cook with a lot of vegetables, herbs, spices and legumes on a daily basis, so our diet is very healthy." Queen of Sheba's menu is a perfect partner for the Palouse region. Pullman, for example, hosts an annual National Lentil Festival, celebrating the fact that nearly 20 percent of the nation's lentils are grown nearby. Ainu's azifa is a salad with brown lentils, while yaterkik alicha (see recipe) is a simple, hearty dish of yellow split peas. Pulse crops — peas, lentils, chickpeas — also known as grain legumes are nutritional powerhouses, high in protein, fiber, potassium, zinc and other minerals. Essential to Ethiopian cooking and to the Queen of Sheba restaurant is a communal environment, represented in the restaurant's two seating options: chair-and-table set with silverware, and casual floor seating around a central table. Wherever diners choose to sit, Queen of Sheba serves a flavorful flatbread called injera, traditionally made from a sourdough-version of iron-rich teff, an ancient grain that sustained people in the Fertile Crescent. Traditionally, injera is used in place of silverware: you scoop or enfold small bites of food from a communal dish (although utensils are also provided, and Queen of Sheba's servers ask guests if they wish their food to be served communally or on individual plates). "I feel a sense of pride when I cook Ethiopian food and like to keep it authentic to the way it's cooked in Ethiopia," says Ainu, who hopes to offer cooking classes in the near future. "I also love introducing people to the cuisine of Ethiopia since it's so different from what they may normally have on a day-to-day basis." 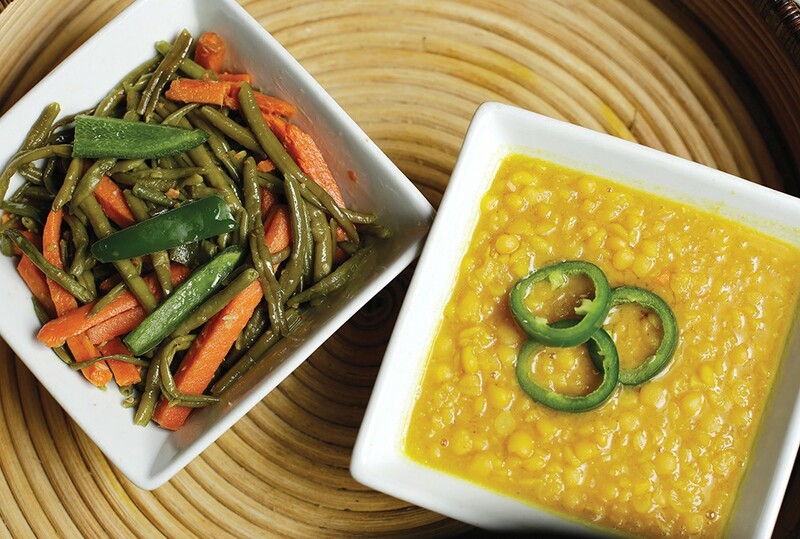 Made up of string beans and carrots, fasolia is considered a stew in Ethiopian cooking. This can either be a one-dish entrée, or a lovely side dish, full of flavor and color, as well as plenty of nutrients and antioxidants. • In a large wok or skillet, sauté onions in oil until cooked soft. • Add carrots and sauté for about 5 minutes. • Add string beans and sauté for 10 minutes. • Add garlic, ginger, salt and pepper and green peppers and cook for another 5 minutes. Translated as "yellow split peas," turmeric gives this vegan dish an even brighter color, while the herbs and spices lend a subtle, yet memorable flavor. Traditionally served with injera, Ethiopia's equivalent to flatbread. For an easy dinner, try this with tortillas or over rice. • Rinse yellow split peas in cold water and boil in 4 cups water until soft. Drain and set aside. • In a saucepan, cook onions in oil until onions are opaque. • Add turmeric, stirring gently. • Add about ½ cup water and let simmer for about 15 minutes. • Add cooked peas to onions and stir to prevent sticking, then simmer another 15 minutes. • Add garlic, ginger, cumin, salt and white pepper. Simmer another 10 minutes, stirring occasionally. Mixture should be the consistency of oatmeal and tender. Add liquid if too thick. Top with pepper rings. The original print version of this article was headlined "Flavors of Africa"